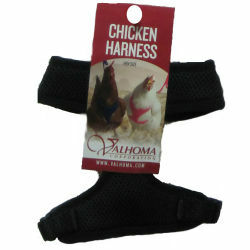 Keep your urban or country chickens easily and comfortably constrained with our harness. It is completely lined with a plush padding and is lightweight. The comfortable mesh harness is designed to fit your or Pullet (11” to 15”), Hen (13” to 17”) or Rooster (15” to 21”).